Monday, June 11, 2018 - Depending on where you stand, we live in the best or worst of times for investors. Last week, the tech heavy NASDAQ Composite Index continued to set new highs, US household wealth hit $100 Trillion in Q1 for the first time, copper prices continued to rise reflecting strong economic activity in China and the recent US jobs report indicated that for the first time in recent memory, available jobs exceeded the supply of workers available. US indexes ended the week registering gains for the S&P 500 and the NASDAQ Composite rising to 2,779.03 and 7,645.51 respectively for a weekly gain of 1.62% and 1.21%. All US Sectors registered positive gains except utilities. Yet, a brief tour around the globe would raise some yellow and red flags for seasoned investors. The usual concerns of rising US interest rates and increasing trade tensions with China were somewhat alleviated by a play to pay solution ($1 billion fine) for ZTE to reenter the US cell phone market. Most unwelcoming however, was a contentious G7 Meeting culminating in the US not signing the customary joint statement at the conclusion of the conference. This was a clear punch to the multinational international trade and monetary regime constructed after WWII under the leadership of the US. 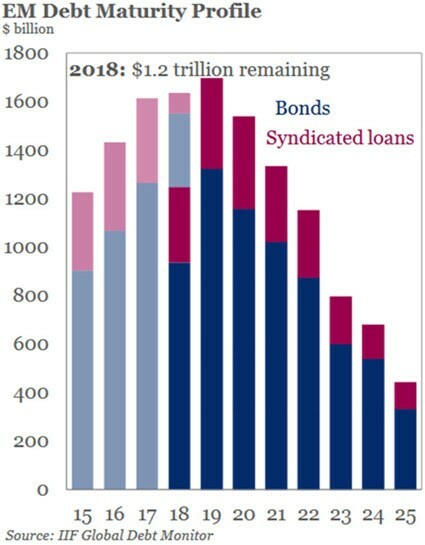 While a lot of this might be posturing by the various members under populist pressure at home, investors cannot but wonder what will replace it…. Headline news around the world will dominate this busy week, starting with the much anticipated North Korean US Summit in Singapore which begins Tuesday. If a deal is announced, traders should expect a short term rally. Country Funds focusing on Korea, China and Japan could provide a nice pop. Next in the headlines will be the outcome of the Open Market Committee of the Federal Reserve when it meets on Tuesday and Wednesday. Investors will be looking for signs of additional tightening on top of the two already expected. The Bank of Japan and the European Central Bank also meet this week. While BOJ is expected to continue its expansionary monetary position, investors will be looking closely at the ECB to see for signs of accommodations to Italy and Spain as we discussed last week. The risk of contagion from Emerging Markets cannot be ignored. The canary in the coal mine may have been the bigger than 6% drop last week in Brazilian Stocks in USD terms and the op-ed article in the Financial Times last week by Urjit Patel, Governor of the Reserve Bank of India, who wrote that the Fed policies will create a shortage of US dollar liquidity in global markets which will squeeze in particular highly indebted countries. 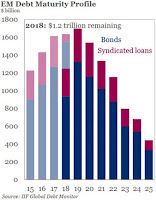 Those Emerging Markets which went on a borrowing binge benefited for years from ultra low US interest rates now face a stronger US Dollar along with rising US interest rates. This hits countries running large current account deficits particularly hard such as Brazil, India, Indonesia, Turkey and South Africa. Investor money is fleeing these markets for the safety of US money markets as evidenced by fund flows. Should these markets come under pressure, one could have investors seeking to cover losses in these assets by selling high priced US stocks – a situation similar to that seen in 1997-1998 during the period of the Asian Contagion. 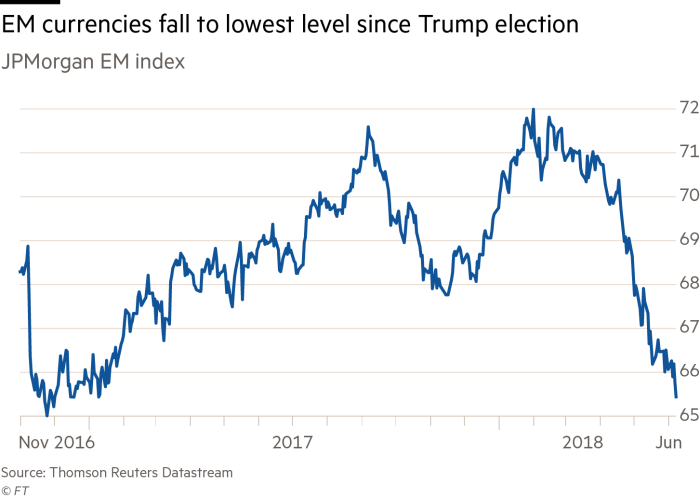 In fact, JP Morgan’s EM Currency Index has fallen 9% from its mid-February peak and trades near the lows not seen since late 2016. See below graph. Now let’s take a look at EM debt and Developed Market Countries debt as a percentage of GNP (courtesy of Mauldin Economics). 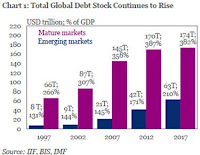 Both have borrowed heavily since 1997 but the Developed world is far more leveraged than the Emerging Markets. Emerging Markets, however, often lack the economic stabilizers that developed countries have should a problem arise. 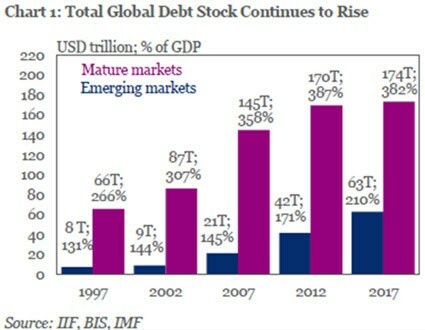 The next graph shows us that large tranches of the EM debt comes due this year thru 2020. Investors should not fall into complacent even with dropping VIX levels. A trigger could easy be a headline out of Spain or Italy or the imposition of a new tariff which could tip a country into crisis and create a domino effect. Given these cautionary markers, if one goes to the beach be sure to bring a fully charged cell phone to be able to react to headline news. Investors must assess if their investment strategy reflects these realities. There are a variety of ETFs available to hedge a portfolio on the downside as well as play particular markets. We suggest a mindful eye on tools like our Select List and Risk and Reward Ratings that can be used to evaluate the vast set of opportunities in the ETF marketplace. Today’s market realities require a new approach to macro investing, one in which individual investors now have access to tools via ETPs to customize risk and return profiles in their portfolios. Use our Scanner to find those funds.